100% linen. Machine wash cold, tumble dry low. Color: White. (I did not care for the quality of the LL Bean linen, it was thin and very scratchy.). This introductory price will increase soon! There are those rare few who have never switched from linen to cotton sheets. I have another set of these that I simply love. 1 Fitted Sheet - 60" x 80" x 15". 100% linen. Machine wash cold, tumble dry low. The linen is stone washed for exceptional softness and a naturally wrinkled finish that gives the bedding its relaxed appeal. The sumptuous sheeting layers well with an unlimited range of bedding. King and Cal King sheeting sets include flat sheet, fitted sheet and two King pillowcases. Machine wash warm, do not bleach. Tumble dry low, warm iron if needed. Fitted Sheet: 80” x 78” x 16”. 8 Piece Ralph Lauren Francoise/ Madeleine/ Genevive/ Dominique Sheet, Shams, Duvet Set. Fitted Sheet Not Included (Ralph Lauren Solid Cream Fitted Sheet will match set). Pratesi 2.0 Collection Infinito Linen King Fitted Ivory New Pratesi 2.0 collection features, a set of non-iron Italian linens that can go from the dryer to the bed without wrinkling. Elegant bedding made by one of the world's finest linen makers. Pratesi is the type of bedding you find in the world's finest hotels and is the preferred choice of celebrities, dignitaries and travelers of the world. INCLUDES 1 KING FITTED SHEET 78 X 80 Care Points: Machine wash cold water using a non-chlorine bleach detergent. Wash dark colors separately. Tumble dry. For best reults, ironing is recommended. NEW 100% Linen MSRP $800. One Pillowcase: 31” x 20 1/2". Machine wash warm, do not bleach. Tumble dry low, warm iron if needed. Inspired by fragrant clusters of the Robinia tree interwoven with solarized branches, this design inspires calmness and diurnal sleep. Created from the finest flax, our bedding is stone washed for softness. 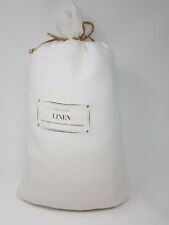 Made with 100% pure cotton percale. Cotton percale is a weave that is noticeably dense and wears well over time. Oeko-Tex® Certified: tested in a third-party lab and verified to be free from over 300 harmful substances. 200-thread count. .
Classic luxury. Duvet Cover - 88in x 92in. This sheet set is made of 100% Belgian Flax Linen. This sheet set is m achine washable. 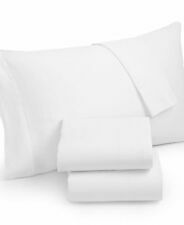 This sheet set includes one flat sheet, one fitted sheet and TWO pillowcase. The faded color effects in the wrinkled fabric/ texture / white linen lines is part of the linen pattern. 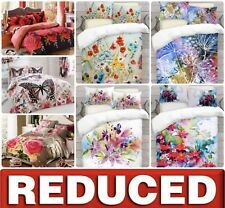 Formore Rachel Ashwell Bedding. 100% Linen. Machine Wash. Two Standard Pillowcase Shams ~ 21 in x 27 in. Zip closure to keep your pillow in place. Hidden Zipper Closure. Ruffled Flange. Pratesi 2.0 Collection Infinito Linen Queen Fitted Ivory New Pratesi 2.0 collection features, a set of non-iron Italian linens that can go from the dryer to the bed without wrinkling. Elegant bedding made by one of the world's finest linen makers. Pratesi is the type of bedding you find in the world's finest hotels and is the preferred choice of celebrities, dignitaries and travelers of the world. INCLUDES 1 QUEEN FITTED SHEET 60 X 80 Care Points: Machine wash cold water using a non-chlorine bleach detergent. Wash dark colors separately. Tumble dry. For best reults, ironing is recommended. NEW 100% Linen MSRP $800. Celine Linen Best, Softest, Coziest Bed Sheets Ever! 1800 Thread Count Egyptian Quality Wrinkle-Resistant 4-Piece Sheet Set with Deep Pockets 100% Hypoallergenic, King Grey. Manufacturer: Celine Linen. See photos for full details. Very good quality. 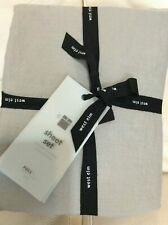 One Queen Size Sheet Set by West Elm in the Belgian Flax Linen Bedding Collection. The Belgian Linen Sheet Set is crafted from fine Belgian flax, which is washed for a lived-in look. Our linen has a crisp, natural texture that softens with every wash.
Santorini washed linen, Designed for those of us who love to sleep in luxury, but prefer a more relaxed look than the crisp Super King W20" x L36" (Plus 2.8" border). 100% Belgian Linen. 1 Fitted Sheet 78" x 80". 2 King Pillowcases 20" x 36". This is the Stars and Stripes patchwork design. No longer available from Pottery Barn. Excellent quality. Could be used as a table decoration. Set of 2 Stars and Stripes Patchwork King Sham Set. King sham size: 20"x36". Restoration Hardware lilac King shams plus matching accessories.